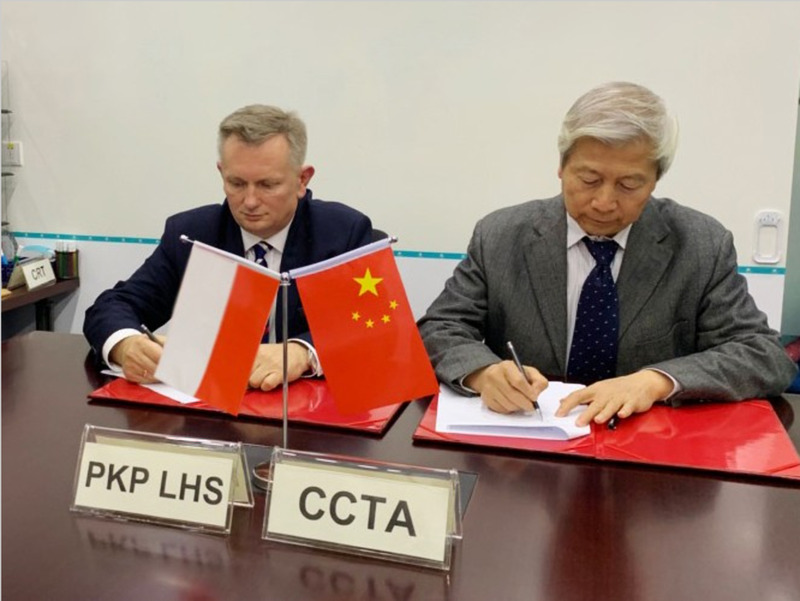 Polish rail freight company PKP Linia Hutnicza Szerokotorowa (PKP LHS) has signed an agreement with China Railway Tielong Specialised Container Logistics B.U. and China Communications and Transport Association on promoting and launching a regular container service from Chengdu to Slawkow. The train is expected to run the first trip in 2019. The documents were signed in Shanghai on the China International Import Expo being held now. The agreement of PKP LHS with its Chinese partners create the opportunity for launching the new rail freight connection from Chengdu to Slawkow via Kazakhstan, Russia, and Ukraine. “The route is expected to achieve normal operational work in 2019, and gradually Chongqing, Xi’an, Wuhan, Changsha, Zhengzhou, and other cities will be included in the project. On the way back, the trains can take the Middle Corridor (previously Trans-Caspian International Transport Route), bypassing Russia, that will enable food exports from Poland,” reported PKP LHS to RailFreight. “We are taking the next step in order to start regular container transportation on the route from China to Slawkow. Thanks to this, we will be able to benefit from the location of the broad gauge line and the possibility of transporting goods without having to reload them on the border. Our partners from China have noticed these qualities, which confirms our development prospects,” said CEO of PKP LHS Zbigniew Tracichleb. This year PKP LHS has launched a few trial container services. In May, a container from Slawkow reached Astara station on the Azerbaijan – Iranian border. The delivery was carried out in nine days, the return trip in thirteen days. The trial ride was a test of opportunities for container railway transportation from Poland to Iran via the Middle Corridor, i.e. via Ukraine, Georgia and Azerbaijan. The company made the second attempt in June to test the rail freight connection with the Chinese city of Urumqi. The container from Poland was delivered in less than twenty days, also via TITR route. PKP LHS operates a 394-kilometer broad gauge railway from Hrubieszow, on the Ukrainian border, to Slawkow, near Katowice. The main cargo carried on the LHS line are coal, iron ore and other bulk. However, the company tries to develop intermodal transportation. Therefore, the new container train to China will be a good option for this purpose.